If I could pick one word that sums up Disney on Ice presents Worlds of Fantasy, it would be FUN. 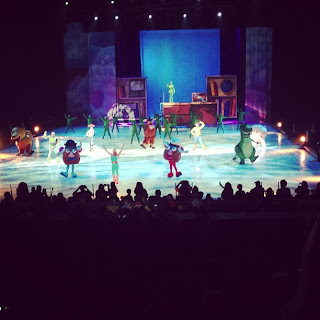 Disney on Ice presents Worlds of Fantasy is a little over two hours long (with one intermission) and goes by fast! I guess time flies when you are having fun, right? Get your food and souvenirs early, before the show begins. Crowds were thick opening night, so I would suggest giving yourself enough time to stand in line to get inside your venue, grab some food (if eating on-site), and buying your souvenirs. This gives you time to soak in the Disney magic and get prepared for the show. 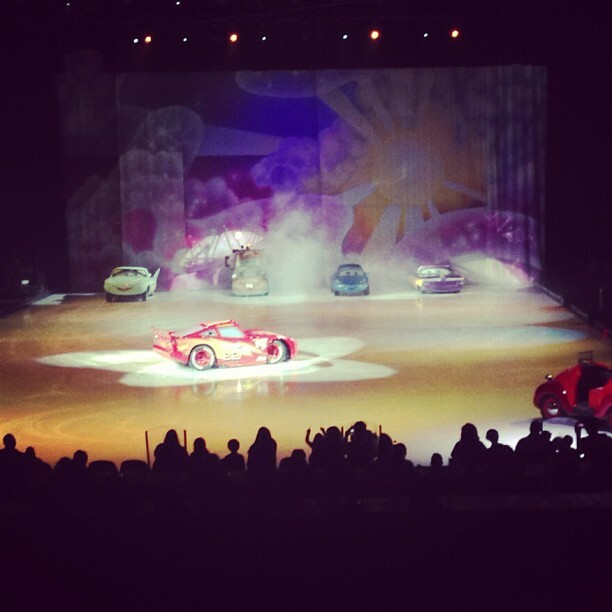 The show opens up with our favorite mice, Mickey and Minnie, entering the ice rink in a red, convertible jalopy. Unfortunately, the jalopy has a hard time running, and Mickey and Minnie need a little help from all their Disney friends. This is where we get to visit the many different realms of Disney's fantasy worlds. The first three worlds take up the first half of the show, and Toy Story 3 is given the entire second half. Personally, Cars is one of my family's favorite movies and collection objects, so for me this was my favorite part of the show. I loved seeing life-size Lightning, Mater, Sally, Flo, and Ramone cars on the ice! What's really a treat is that Sally, Flo, and Ramone are rarely (if ever) seen anywhere else (even on Disney property in Florida and California)! Next up - Pixie Hollow and Tinkerbell. I will be shorter than usual here - I don't enjoy Pixie Hollow, and I don't enjoy Tinkerbell, so I was disappointed in this segment of the show. There are so many classic Disney stories and characters to choose from, so why pick Tinkerbell? I know, I know. Tink is very popular with today's young Disney fans, and Disney has been more than happy to oblige them by marketing Disney and her fairies to the point of - well - overkill (in my opinion). Again, I will say that I was very disappointed that Disney chose to give Pixie Hollow what appeared to be the longest segment of the first half. I saw almost all the adults around me playing with their phones during this segment. I think it's partly because the characters are new and not quite as charming or enduring to us or that we just don't know them as well as the older characters. 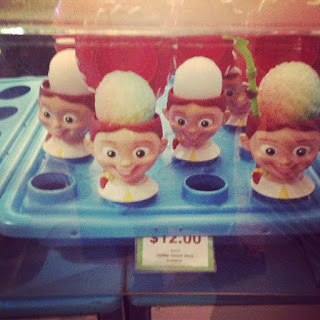 But, then again, I did take my 16-year old, who kept whispering to me, "This is so stupid! Why would they put Pixie Hollow in the show?" Next up, intermission and then the "meat" of the show - TOY STORY! Of course, everyone loves Toy Story. It is amazing to me that Toy Story now has three movies to it's credit (with another one rumored to be in the works) and each one is just as popular as the ones preceding it. Disney on Ice presents World of Fantasy proved that point. People sang along, children stared wide-eyed with jaws dropped, and we all cheered (or jeered) at the appropriate parts. The stories are tried and true, and we all know them by heart. To end the night and to wind up Disney on Ice presents World of Fantasy, Disney treats us to a rousing Grand Finale of "Move It Shake It" by most of the show characters and brings back our Fabulous Five - Mickey, Minnie, Goofy, Donald, and Pluto. All in all, I would not have missed this show. I am a self-proclaimed Disney addict and any time Disney comes to town, I am usually there to greet it. This show is great for all ages - the littlest Disney fans, the adults (like myself), and I actually saw a lot of teens there on dates! It's a fun, family entertainment show that everyone can enjoy (plus it's pretty amazing to see what these athletes can do on ice skates)! Another thing -- If you're going, feel free to take your Mickey Ears (if you got 'em) and dress accordingly. I saw a lot of people with Mickey Ears adorned and plenty of little girls in Princess dresses and tiaras. When Disney comes to town, it's always special. 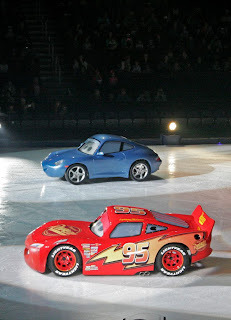 Disney on Ice presents Worlds of Fantasy is in Atlanta through Sunday, May 5th. Tickets are available through the box office at the Arena at Gwinnett Center or via phone (1.800.745.3000). You can discover more about Disney on Ice presents Worlds of Fantasy at their website or on their facebook page. *Special thanks to Feld Entertainment for providing an opportunity to promote and review this show. In exchange for promotion and review, we were given tickets to preview the show while in Atlanta. All opinions expressed are my own and do not reflect any organization I may be associated with.